Stirring historical drama to mark the centenary of the Xinhai Revolution, which caused the collapse of China’s dynastic rule and the appointment of Sun Yat-sen as the country’s first provisional president. The film runs through the radical politics of the time at a fast and methodical rate, skipping over key details in favour of presenting an emotive and violent struggle in which large volumes of everyday Chinese lost their lives in a number of failed uprisings. Their names appear on screen to acknowledge their sacrifice. Jackie Chan – who also acts as co-director and executive producer – positions himself as Sun Yat-sen’s military advisor, Huang Xing, and he provides an impassioned performance. His presence instantly gives the film an international remit, and the filmmakers appear keen to capitalise on this by plotting the steps to revolution in easily digestible chunks for an overseas market. 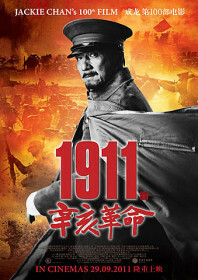 Yat-sen’s more inspired speeches are performed in English via situations with his American advisor and doner, Homer Lea, and most of the film’s fervour is channeled through a series of bloody battle scenes. This broad scope may explain why the film flopped in China. It’s not really a kung fu movie, but Jackie Chan followers will still enjoy seeing another straight performance from the actor who, according to the film’s marketing department, is celebrating his 100th film appearance. AKA: China 1911; 1911 Revolution; Xinhai Revolution.